This is the third Wood Stove Design Challenge (WSDC) that has used cordwood-fueling protocols. However, the two previous times we had to use a unique protocol that was not connected to any protocol used for EPA certification testing. The 2013 WSDC test protocol was developed by Ben Myren for a field setting using Testo and Wohler mobile PM samplers. The 2014 WSDC test protocol was developed by Tom Butcher for use in a Brookhaven National Laboratory lab with scales and a dilution tunnel, but also relying on Testo and Wohler samplers. This time, we will be using a modified version of an Integrated Duty Cycle (IDC) Test Protocol that is being developed by NESCAUM for consideration by the EPA as an approved certification test method. 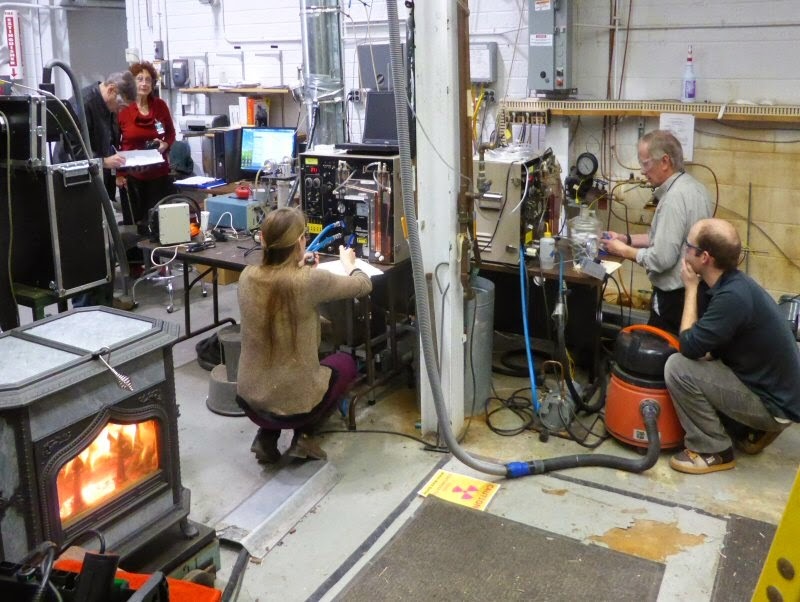 The protocol is being developed pursuant to “Docket EPA –HO-OAR-2016-0130, Process for Developing Improved Cordwood Test Methods for Wood Heaters.” The testing protocol for the thermoelectric stoves will be different and will be posted soon. A core goal of the Wood Stove Design Challenge is to approximate conditions that stove operators face in the field. A challenge that we have not been able to test is operating the stove with high moisture content wood. The New Source Performance Standards adopted by the EPA in 2015 require that stoves be tested with crib wood at 2 grams an hour of PM or less by 2020. Using cordwood is optional and manufacturers have to achieve 2.5 grams of PM or less by 2020. However, as of 2015, there was no standard cordwood test protocol and the only way to certify with cordwood has been to petition the EPA to use an Alternative Test Protocol. The ASTM 3053-17 cordwood test method has been in development for many years and it is now complete. It also sought to “be more predictive of in-home performance than other test methods” by capturing start-up emissions. The IDC built upon the knowledge of cordwood testing issues gained in the ASTM 3053-17 and European BeReal test method efforts. The goal of this test method is to increase the ability to reflect in-home performance. It does this by creating a single test run that incorporates typical use patterns and incorporates variability both in the operational modes and the fuel use patterns. Creating this type of test allows for completion of repeat tests (replicates) so testing can also assess variability of appliance performance. The IDC, the ASTM and other methods also have to provide a basis for determining heat output, efficiency, and carbon monoxide emissions. In all Wood Stove Design Challenges, we are required to develop or modify protocols to enable us to test 5 – 10 stoves during a 4 – 5 day period. This is enormously challenging, as each stove must be tested at least twice so that averages can be calculated. It also requires short test methods that do not capture the entire length of a fire and requires choosing which parts of a burn to sample. For this challenge we will be using a compressed and modified IDC protocol that will assess the capacity of automated wood stoves. Another core goal of the WSDC is transparency. The WSDC is a technology competition, requiring us to fairly test stoves against one another. But it is also a teaching event where those present or remote can witness testing and the results and learn about the challenges, vagaries and importance of test protocols. We strive to provide results quickly to the teams and the judges and then to the public. The IDC has been developed mainly by NESCAUM, with funding from NYSERDA and the Washington Department of Ecology. Mark Champion has done extensive testing on it at his lab in Vermont on the protocol. The point person at NESCAUM, Lisa Rector, who is on the Organizing Committee of the 2019 WSDC, has also been vetting the draft protocol with industry members at various stages of its development. A webinar series in the lead up to the WSDC featured Lisa discussing the protocol development. She currently predicts that it will be finalized in the summer of 2018. The goal of the IDC is to create a test method that reflects the variability in operation and fueling that might be expected from in-home use of wood stoves. It also has the potential to validate field performance. The IDC is being built with more transparency than the ASTM 3053-17 so that it can build confidence within EPA, states and industry. Incorporates varying fuel burn conditions to include different coal bed sizes, different sized fuel pieces, and varying fuel loads.